Beetle--According to the Coleopterist Society (coleopterists are people who study beetles and their habits), beetles are the dominant form of life on earth. One of every five living species is a beetle! Various beetle species live in nearly every habitat except the open sea, and for every possible kind of food, there is a beetle species that eats it. Beetles appeared before dinosaurs existed, and they now greatly outnumber the dinosaurs' descendants, the birds. Beetles include beneficial and pest species, beautiful and plain, huge and tiny. They have even had a role in human culture, most notably among the ancient Egyptians, who revered the sacred scarab as a symbol of life and rebirth. See Asparagus Beetle, Blister Beetle, Calligrapha Beetle, Colorado Potato Beetle, Cucumber Beetle, Elm Leaf Beetle, Flea Beetle, Ground Beetle, Japanese Beetle, June Beetle, Lady Beetle, Mealybug Destroyer, Rove Beetle, Soldier Beetle. Some beetles attack plants that are in stress. Spray Garrett Juice plus citrus oil for problem infestations, but make sure the beetle in question is harmful because many are beneficial. Apply beneficial nematodes to the soil for additional help. 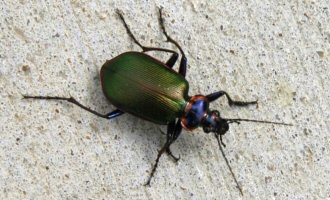 Shown below is the beneficial caterpillar hunter beetle.